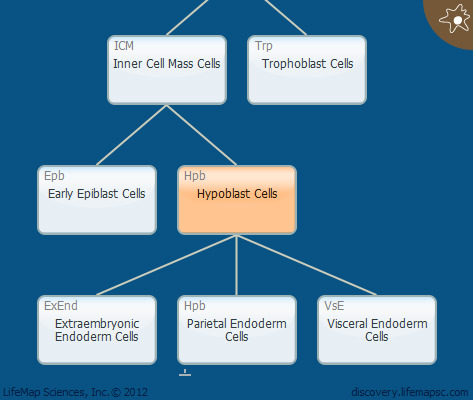 Hypoblast cells form an extraembryonic cell layer on the surface of the inner cell mass and faces the blastocoelic cavity. It gives rise to the visceral and parietal endoderm. The hypoblast cells are separated from the epiblast layer by an extracellular basement membrane. These cells are evident from E7 in mouse development. Lineage marker transcription factors are: SOX17, GATA4, GATA6, PDGFRa. Human hypoblast differentiation differs from that observed in mouse, rat and cow embryos in their absence of appreciable Laminin expression in the presumptive hypoblast and downregulation of GATA6 in a subset of SOX17-expressing cells. This, in addition to different reactions to FGF/Erk signaling inhibitors, suggests that the human hypoblast may segregate by unique mechanisms. Remarkably, in contrast to murine and bovine hypoblast development, human hypoblast development does not depend on MAP kinase signaling.